The field of dentistry is rapidly evolving. 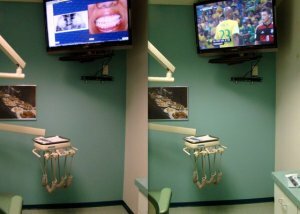 It has always been our philosophy to incorporate the latest dental techniques into our practice. In the following pages, let us show you the results of some of the clinical procedures which we do every day. Whether you are coming in for a smile makeover, LASER gum recontouring, 1-visit CEREC porcelain dental restoration, 1-hour tooth whitening, Six Month Smiles, INVISALIGN or dental implants, our objective remains the same – to help you create that winning smile! Dr. Wong is a Member of: American Dental Association, California Dental Association and San Diego County Dental Society Graduate of: University of Pacific, San Francisco (DDS, 1986) University of Michigan, Ann Arbor (MS, 1988). We all know that time is a precious commodity, if Dr. Wong does not see you within 10 minutes of your scheduled time, you will receive a $20 Starbucks gift card plus a personal apology from him. That’s a promise! If you like to consult us concerning your dental needs, please call our office at 858/587-2828, text Dr. Wong at 858/518-2354 or schedule a visit online. We are open Monday through Friday. With our stain removal and prophy blasting handpiece, you will always walk out of our office with a clean and fresh feeling in your mouth. Implants are an effective & reliable means of replacing missing teeth and securing bridges & dentures. Invisalign TM is the discreet alternative to metal braces, providing alignment with a clear fitting that is removable and unnoticeable to others. TM detector is a painless, easy way to detect cavities that may otherwise be overlooked by the naked eye. Less radiation exposure, enhanced patient awareness, time saving and environmental friendly. Watch the news or look at your own mouth in a whole new way – on our beautiful 42 inch HDTV. Our porcelain crowns are designed and milled right before your eyes! It’s incredible. 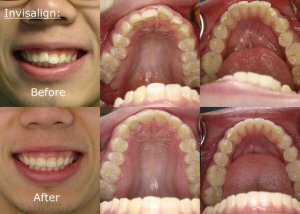 Check out Dr. Wong’s smile makeover portfolio. 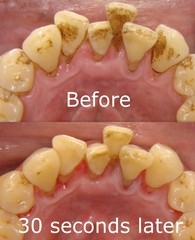 In some cases, dramatic results can be achieved in one visit.